The first and only city on my list, Napier stands out among New Zealand communities. Much of its distinctive character came after a 1931 earthquake leveled the city. The rebuilding effort spurred the local economy out of its depression, and the facades were styled in progress-oriented Art Deco. It’s a city that values form and aesthetics, both natural and man-made. Exceptional weather doesn’t hurt either. More Napier pictures can be found here. South Island’s west coast feels a lot like the edge of the world. The beaches are violent and rocky, and the lush vegetation gives it a primal, wild sort of atmosphere. Punakaiki is a tiny settlement that exists for no purpose other than to service the hordes that come to see the area’s most striking feature: a unique coastal rock formation called Pancake rocks. 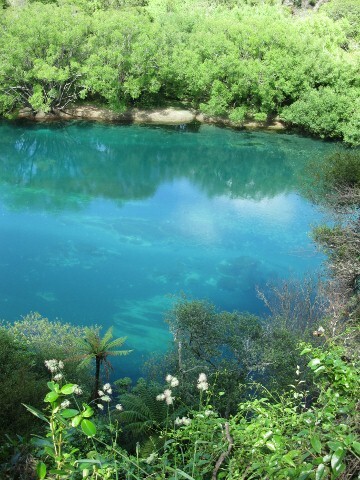 As it spills out of Lake Taupo, the Waikato is an unreal blue color. It’s so vivid, it almost looked fake to me, like it was an elaborate, river-shaped swimming pool. 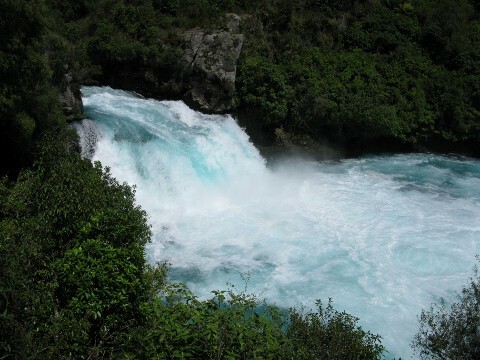 I hiked a few kilometers alongside it until I reached the famous Huka falls. 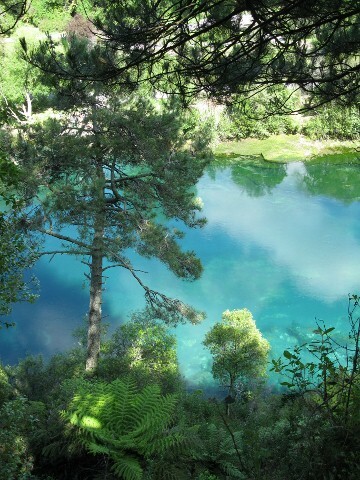 Taupo’s Bungee Jump is situated above a picturesque bend in the Waikato. More Waikato River pictures (including the bungee jump site) can be found here. Franz Josef Glacier is a huge draw on the South Island’s West coast. I teamed up with an American girl I met in Punakaiki to tackle a 1300m mountain called Alex Knob to get a higher (and cheaper) vantage point of the glacier than we’d get from a guided tour. The mount was shrouded in mist the whole time, so we didn’t see much of the glacier, but we still got some incredible views of the surrounding rainforest and mountains. More Franz Josef (and Punakaiki coast) pictures are here. I spent the week of Christmas in the South Island’s Abel Tasman National Park. My original idea was to do a whole five-day coastal trek and spend Christmas Day in the backcountry, but I decided to cut it short when I realized I was the only solo hiker on the trail — among about a dozen vacationing families. I also had horrible blisters from wearing brand-new shoes. So I turned back after one night out there, to spend Christmas Day with my friends in nearby Marahau. Still, I saw a good 12 kilometers of the track and it didn’t disappoint. I made two visits to this laid-back area north of the Abel Tasman. On the second trip, some friends and I explored the bay’s northern edge — a 30-kilometer expanse of sand called Farewell Spit. We braved a sudden sandstorm on the way across, then hiked into 80-kph winds on the way back inland. I didn’t take many pictures of it because I was afraid to get sand in my camera, but I’ll never forget the experience. A decaying pier out near where we camped One of Golden Bay’s wide beaches The sandstorm on Farewell Spit. If you look closely there are two wayward hikers in the distance. On my first full day in New Zealand, my Auckland host took me out to three incredible beaches in the Waitakere range, west of the city. I was dumbfounded by the effortless beauty of these places. It was the perfect introduction to New Zealand. More Waitakere pictures are here. Mordor! A rugged, volcanic landscape that more closely resembles Mars than typical North Island New Zealand. It provided the perfect filming location for the evil realm of Mordor in The Lord of the Rings trilogy. There is a famous 19km hike through its center called the Tongariro Alpine Crossing. I lucked out with the weather and had an unforgettable day. More Tongariro pictures are here. The Coromandel is a wild, green peninsula shaped vaguely like a hand giving the middle finger to nearby metropolis Auckland. I spent most of my last week in New Zealand cruising its winding coastal roads in a rental car. I loved it and wish I’d given myself more time. Supposedly it’s the region where the first human beings landed in New Zealand a thousand years ago. Understandably, they never went home. More Coromandel Pictures will be posted on David Goes Kiwi soon. I think the first thing I did to prepare for my New Zealand trip was to book a spot on the famous Milford Track. It’s New Zealand’s most well-known hiking trail, and only a limited number of spots are available every year. I booked in August and the first available spot was January 29th. That exclusivity set some pretty high expectations in me, but the “finest walk in the world” lived up to them, it really did. Fiordland is a magical place. Hikers are advised to prepare for heavy rains, as the Fiordland area gets pounded year round, but miraculously, we had four straight days of sunshine. The 300+ photos I took don’t really do it justice. One of countless river crossings throughout the track Everywhere you go on the track there are sheer mountain walls on either side, streaked with waterfalls Looking down the valley from Lake Mintaro. On the mountain face you can see dozens of tiny waterfalls coming off the snow field. The mossy basin at the bottom of the 600-meter Sutherland falls. We all took turns climbing on the rocks behind the falls. The falling water creates a powerful wind — it’s hard to catch a breath in the thick spray. In the foreground is a Swedish hiker, making her way to the base. The natural beauty of New Zealand blew my mind many times over. These are just ten of the places I visited in my six months, and there is so much I didn’t see. New Zealand has a piece of my heart forever. I will be back one day, no question about it. Nobody regrets going to New Zealand. Hey.. Your pictures are stunning. I’m going to New Zealand tonitee from Sydney. Your pictures really give me goosebumps. I would like to know what camera and lens(lenses) you’ve been using for this amazing photos? Hey Chris. All of the photos here were taken with a cheap panasonic point-and-shoot. I’d love to go back now that I’ve studied photography and have a decent camera. Hey David, thanks for sharing your beautiful pics and experience!! I did the north island a few years ago and have been kicking myself ever since for not making it to the south island (I know it was ridiculous to go all that way and it do both but alas, out of my control). My boyfriend and I are returning in March ’13 and FINALLY doing the south!! 10 days in NZ and 4 days cook islands (not including travel time). Do you think it’s practical to fly into CHC and hit up all the way down to Milford Sound and all the way up to Abel Tasman? With Queenstown and a Fox or Franz Josef glacier walk in between (I’m aware that this a LOT of driving but we plan to do a car hire). I’ve been warned too not to try and do too much in too short of time (especially since we want to hike/kayak/bike as much as possible)….so wondering if you have any advice? I’m torn because Milford and Abel are both “must do’s” on the list and right now I don’t think I can extend the trip past 10 days. Money is somewhat of a factor as well. Thanks in advance for any advice! Cheers! I have been to Karekare 5 years ago. Oh, my goodness! It is the most fascinating and calm place I have visited in my whole life. Next April I will be in NZ again and I just can’t wait to step those dark sands again. I am heading home to NZ in 7 weeks and I can’t wait. These pics remind me so much of what I miss. I am based in Raetihi near Mt Ruapehu and love the small town fell when I’m there. Thailand is a great place to live and work but it makes me appreciate ‘home’ so much more when I’m there. Thanks for sharing the pics and info. How wonderful to see and read about our beautiful country and to be reminded that it is still out there. I live in Christchurch and sometimes I long to see something “nice” as there is so much ugly happening in what was once my beautiful city. ps: so envious right now! 2. Mount Manganui Beach. I live 15min away from here and always forget how lucky I am. 3. Moeraki Boulders are also really cool. These would have to be three of my favourites! Are you in Mangatapu or somewhere around there? Hi,….You must visit the Bay Of Islands,great hiking in the Puketi Forest. Drive up to Cape Reinga Lighthouse…you can see where the Pacific Ocean and the Tasman Sea meet together, its beautiful, that is the tip of the North Island. Hi David!, Congratulations for your blog!! I’m living in NZ, and I want to go to Paparoa National Park, was Te Nikau a good place to stay? Could you recommend me a hostel? Te Nikau was an amazing pace. So peaceful and beautiful. Book it! Those pictures are breath taking. I have to plan a trip there one day. This is the place to be not Hawaii or Tahiti, NEW ZEALAND IT IS! it was good seeing your excellent pictures. I prefer New Zealand to anywhere else in the world to live (second is Vancover, British Columbia). Come up North when you come again. We have the best dive in the world at the Poor Knights Island. It’s all a great pictures you have shared & a truly a place that should not be missed. Am Lawrence from Singapore, I have visited Australia seen most of the places as my brother leaves there in Adelaide. I have always wanted to visit New Zealand but didn’t get an opportunity, well now am all prepared to go next month for a very short visit like a week cause need to get back to work you know Singaporeans are all workaholic. Could you please advice where I should really head too for such a short trip that I would always cherish in my heart as this is my very first visit to New Zealand? If I only had a week, I’d fly into Auckland, then head out to the Bay of Plenty, swinging through the Coromandel on the way. Really amazing palce love to visit it. Thank you sir and everyone else who contributed their info. Heading To N.Z. in a week for six weeks. I’ll be looking for all these places. I hope one day when I retire, I’ll have the resources to be able to buy a home there and live off the rest of my life in that beautiful country. Much like how Bilbo lived at Rivendell. i am living in NZ , it is really nice place to live ..
Hi David, I have two questions I would love your thoughts on! And thanks for this great summary!! 1) Can you recommend which is more scenic and beautiful beaches… Coromandel or Waitakere beaches? 2) In Coromandel area, which beaches do you think are prettiest (and quiet vs many people)? Three possibilities I found are Cathedral Cove, New Chums, and Onemana. Curious your thoughts on these or all in Coromandel. I didn’t see all that much of the Coromandel’s beaches, but the waitakere beaches were absolutely unreal, you just can’t go wrong. If you are a beach person don’t miss the Waitakere area. Excellent site. I have lived away from NZ now for 6 years and seeing your photos , reading your comments and the comments of others makes me so proud to have grown up there and call New Zealand home. Two of my children have yet to visit New Zealand . It isn’t until you leave the place you realise how much spectacular beauty there is there and how easy it is to become so accustomed to it that it can be taken for granted. I am now officially home sick and misty eyed. My family and I are now due to fly to NZ in 3 weeks. Thanks for the reminder. Top Blog! We think the Catlins are a MUST SEE for New Zealand. The penguins and dolphins plus the amazing beaches make it incredibly beautiful and diverse! We’ve been living here for 6 months now and the days we spent in the Catlins were some of our favorites! I love new Zealand very much,beautiful country. NZ looks awesum! Planning a trip down there from Singapore. Each n every pic looks amazing, really dont know what to cover and what to leave. Got only 12 days. Any suggestions, what are the best places to cover. Wanna go in the interiors. Hi there mates, how is all, and what you wish for to say on the topic of this piece of writing, iin my view its actually awesome in support of me. Thank you very much for all pictures. All pictures are very beautiful. I like to visit New Zealand but it is a dream.One day i will come to visit all places and the most beautiful place is the Waikato River.